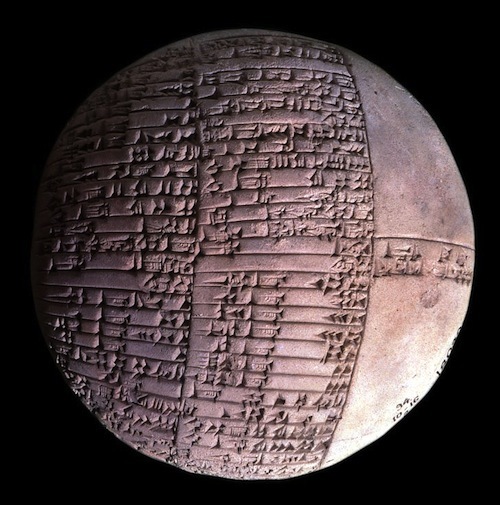 Actually it’s a round clay tablet from Ur which dates back to 2039BC. It records areas of fields and barley yield. I also posted a picture of an even older tablet from Uruk, 3300BC-3100BC, which uses a symbol for barley that looks like, well, an ear of barley. Some decorative woodcuts by Fernand Chalandre, from about 1919: Peasant girl carrying pail — poplars near water — a bowl of flowers — the town of Nevers. And some aquatints by the Australian artist Fred Williams: Road and Saplings, Cottlesbridge — Trapeze — The Can Can — Burning Log. A great photograph of Lucian Freud from the 60s. RIP. 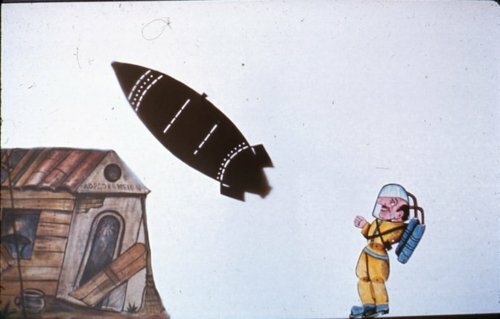 There are some interesting photographs of Greek shadow-puppet shows in the British Museum. My favourite is Karagiosis the Astronaut, above, but Karagiosis can also be seen ‘In the Claws of the Gestapo‘ and shooting the head off a Turk. Some links: why people are better at paper-scissors-stone if they are blindfolded. The problems with software patents. The perils of trusting your data to the cloud (or in this case, to Google). Neptune’s heart, zipperback and the gangly lancer are among 10 new names that have been given to British plant and animal species, thanks to Natural England’s “Name a Species” competition. An interesting new approach to designing wind farms. Decorated initials: P — Q — E — B. Satellite photographs, via NASA: Alaska — Australia — Iowa — Bahamas. Some odds and sods: baby millipedes — a weird caterpillar — a Brooklyn stoop, 1976 — Japanese iris plate — Gisèle à “La Boule Blanche”, Montparnasse, 1932 — an ingenious crossword — woman with garlic.